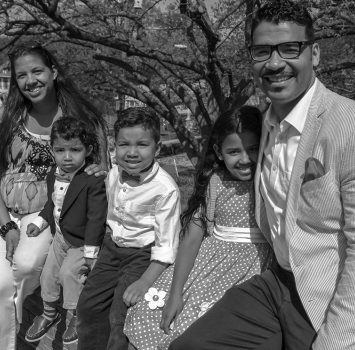 After growing up in the church, walking away, and being rescued by God while on the campus of New York University, Russ sensed a call to ministry and immediately pursued the theological training he needed to lead and care for people. He received his Master of Divinity from Westminster Theological Seminary and was called by Grace DC to serve as an assistant pastor of our Downtown congregation. A few years later, he teamed up with a wonderful group of people to plant Grace Mosaic in NE DC. Russ is now serving as the lead pastor of Grace Mosaic, Director of Cross-Cultural Advancement for Reformed University Fellowship, and is a visiting professor in Practical Theology at Reformed Theological Seminary’s Washington, DC campus. Russ has made written contributions to Heal Us, Emmanuel: A Call for Racial Reconciliation, Representation and Unity in the Church (White Blackbird Books, 2016), All Are Welcome: Toward a Multi-Everything Church (White Blackbird Books, 2018), and 9Marks Journal. He loves talking BBQ, smoking BBQ, and eating BBQ. He enjoys making music, and he’s having the time of his life raising four fun-loving children with his lovely wife, Vanessa.